Oscar-winning director Damien Chazelle had paired up with Oscar nominee Ryan Gosling to give us a stunning musical called La La Land in 2016. Almost 2 years later, they come together again to bring to life on screen the story of the first man on the moon, the enigmatic Neil Armstrong who first set foot on that bright, faraway orb. Based on James R. Hansen's book "First Man: The Life of Neil A Armstrong", First Man stars Ryan Gosling as Armstrong, and covers 9 years of his life, from 1961 to 1969. It depicts his trials and tribulations during this period in both his personal and professional lives, and ends with him landing on the moon. First Man starts with Armstrong's time as a test pilot. When a personal tragedy occurs, he applies for NASA's Project Gemini. The movie then chronicles the space race between Russia and America, how Armstrong's wife and kids adapt to his continuing absences, and the public discourse during the period where the general populace questioned the need to fund NASA missions, with Armstrong's life and journey as a through line during these events. The star of the show is definitely the director Damien Chazelle who is once again in great form. With Whiplash, Oscar-winning La La Land, and now First Man, Chazelle has mastered the art of ending a film on a high note thereby elevating the movie and the experience of watching it. 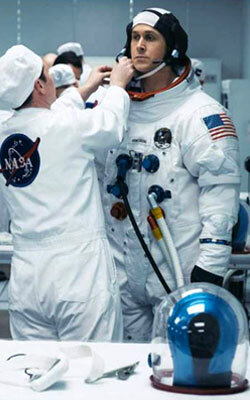 That said, First Man is not without its faults. It drags quite a bit, especially in the middle, when the frustrations of the people in the story because of their failures reflect on the audience watching the film, making them wait for the inevitable climax on which the movie hinges. A few unnecessarily long scenes trying to build the "suspense" in a biographical drama makes you want to nod off. But a little irony never hurt anyone, they say. However, the end, when it comes, doesn't disappoint, and gives you the adrenalin rush that those other scenes threatened to take away from the experience. And for some weird reason, you find yourself fist-pumping the air when Armstrong finally sets foot on there and says that historic line. The reactions to the main event are also equally awe-inspiring. The very people who questioned the need for the mission lauding the unbelievable achievements of NASA makes you hope for many more such small steps for man and giant leaps for mankind. This is the story of an incredible achievement for humanity, and hopefully future generations will look up to the story for inspiration. 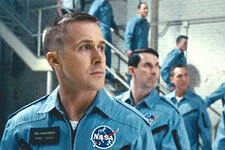 Ryan Gosling is the emotional centre of the story, and he plays the stoic Neil Armstrong with utmost competence. Getting a look into Armstrong's domestic life and being able to believe that Gosling is the man the movie is about is what it is all about, and that is a commendable job done. The supporting cast also are top-notch. Claire Foy's Janet Armstrong is at times unlikable, but that is not the fault of the actor but the necessity of the character. She shows strength and vulnerability in equal measure, especially in the second half when she confronts a stubborn Neil Armstrong to do the right thing, and you're nodding and going, "She's right, you know." Jason Clarke as Ed White and Kyle Chandler as Deke Slayton also stand out. And a special shout-out to Corey Stoll who has an extended cameo as Edwin "Buzz" Aldrin, and brings the charm and straightforwardness of Armstrong's co-traveller to screen. There are moments when you just will him to keep quiet and not deliver his two cents. But hey, that's what they say about all outspoken men in history. Chazelle delivers the Apollo-11 moon-landing mission sequence with masterful precision with some solid expertise from the music (Justin Hurwitz) and cinematography (Linus Sandgren) departments. The cinematography is not all great news, though - there are some scenes in the movie that grate on your nerves and confuse you about whether they are artistic or simply jarring. As for the music, there's a song named "Whitey On The Moon" that sort of makes you raise your eyebrows on first listen. To be, um, fair, it's not about what's in the movie at all. And to see Chazelle using a song about the Cold War in the context of a white man landing on the moon isn't pleasant at all. First Man is in no way a regular popcorn entertainer and neither does it pretend to be one. It was made with an eye towards the upcoming awards season, and you can bet that the movie will feature in multiple categories. In the end, it will be remembered for its technical mastery, and for Chazelle stepping out of his comfort zone (musicals) and exploring the world of biopics, coming out a stronger director. fullhyd.com has 700,000+ monthly visits. Tell Hyderabad what you feel about First Man!